In 2006, Gunma Daruma Doll Manufacturing Cooperative Union had “Takasaki Daruma“ registered as trademark. It’s registered under Regional Group Registered Trademark No. 5003697. In about 200 years ago, there lived a farmer named Tomogoro Yamagata in Toyooka Village of Takasaki. He and his family made Daruma dolls in winter when they were not busy on the farm. His Daruma dolls were called Toyooka Daruma. Approx. 80 years later, many silk-raising farmers in Toyooka and neighboring Yawata areas started to make Daruma dolls. As they became able to produce Daruma dolls in large quantity, they began to sell them at the New Year’ s festivals at Shorinzan Daruma-ji Temple and the nearby areas. Covered in a red priestly robe from head to toe, with big eyes wide open and lips tightly shut, Daruma dolls have a sturdy body. Their thick eyebrows are drawn in the shape of a crane and the mustache in the shape of a turtle. It is believed that cranes live 1,000 years and turtles 10,000 years, respectively. On its cheek and plump stomach, Fuku or lucky/good fortune in a kanji character, together with creases of priestly robe are painted in gold. On both ends of its face, the owner’ s wishes are written also in gold letters. Every Daruma doll is made by hand carefully using the 200-year old skills and techniques. We hope you can see the grace, virtue, and benevolence along with the strength in the face of Takasaki Daruma dolls. Every creator of Takasaki Daruma doll makes a wish for happiness and well-being of its future owner throughout the coming year. Takasaki Daruma creators make Takasaki Daruma dolls believing that each and every one they make is able to eliminate the source of conflicts of many kinds by keeping families in the world safe and secure. Takasaki Daruma creators will keep on making Daruma dolls wishing for the happiness and well-being throughout the year for future owners for many years to come. Here are answers to some typical questions we are asked at Daruma markets and by new owners of Takasaki Daruma dolls. Q. Do we paint the left eye pupil first or the right one? A. We recommend that you paint the left eye pupil first. It is believed to have come from the fact that left seats are above the right ones in the Japanese seating arrangement protocol. There are, however, no rules spelled out for this matter. To physically paint an eye on the pupil of a Daruma doll signifies opening of one’s mind. 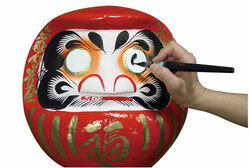 In other words, by painting a Takasaki Daruma’s eye pupil, you have opened up the eyes of your mind. We used to paint a wide-eye on Daruma before handing it to the new owner, but over the years it has become a norm that those who make wishes to the Daruma doll paint the eye pupil themselves. Q. Where should I enshrine a Takasaki Daruma doll? People used to enshrine a Daruma doll in their homes on the left side facing the home alter. Modern houses don’t have home alter, so it is no longer a must. Although there are no rules spelled out for this matter, certain points should be observed. •At home, a Daruma doll can be placed at the Tokonoma alcove, on a sideboard, or other places where family members can see it well. If it is for a success in examination, it can be placed on a desk of the person who is facing the examination. •As for the direction in which to enshrine the Daruma doll,we recommend that you place it facing either the south of east. Q. Takasaki Daruma dolls come in all sizes and shapes. Why? A. Because we want all of your wishes granted. Some people want to buy Daruma doll one size bigger than the one with which made their wish come true. “We cater to their needs” is one reason. When wishes were not granted despite the help of a Daruma doll, we recommend them that they buy a Daruma doll of the same size. Another reason is for consideration to the space available in a home to enshrine a Daruma dolls.You can choose your very own Takasaki Daruma dolls from all sizes and shapes.